288 Ten Hour Unscented White Votives White unscented ten hour votive candles. Great for use in restaurants dining room tables, hotel lobbies and wedding runways. 1 3/4 inches x 1 1/4 inches. 10 hour burn time. 288 candles per case. Solid wax with cotton core wicks for cleaner burn. Box Size 9 inches by 9 inches by 18 inches Glass Votive holder is available #VH 10. 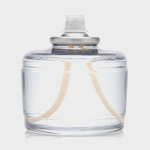 15 Hour Votive Candles odorless top quality 288 per case. 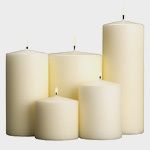 3 X 6 Pillar Candles, Unscented, 12 per case. 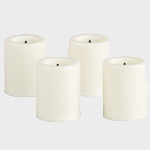 3 X 9 White UnScented Pillar Candles 1 doz. per case. HD 17 Fuel Cells 17 hour 48 per case, odorless, by Hollowick. HD 36 Fuel Cells by Hollowick-odorless 24 per case. 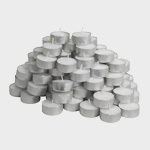 Tealite Candles 3/4H X 1 1/2 Diameter, 5 hour burn time, odorless, 500 per case. 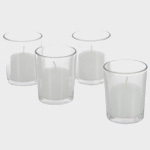 Libbey 2303 Votive Candle Holders, 3dozen per case.